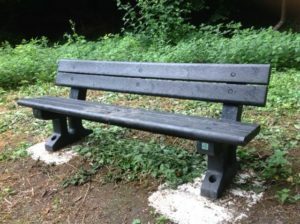 The Valley Conservation Society have been able to provide a new seat and noticeboard in the Lower Crisbrook Meadow thanks to a £1,500 KCC members grant from Brian Clark. The Valley Conservation Society purchased 2.15 acres of derelict scrubland with the aim of turning it into lowland wet meadow for the public to enjoy. As part of this scheme the society wanted to provide a noticeboard with a map and history of the area and a bench for people to sit and relax and enjoy the area and views.